New builds are now available on the Live Builds page, bringing us up to build #81 across all platforms. A lot has happened over the last month, with steady contributions from long-time Daggerfall Unity developers Lypyl, Allofich, TheLacus, and Nystul. I would also like everyone to welcome on board new developer Hazelnut, who has built many valuable updates over the last month. I’ll post a more complete list of updates towards the end of this post, but want to start with the big visual stuff that’s changed since last update. 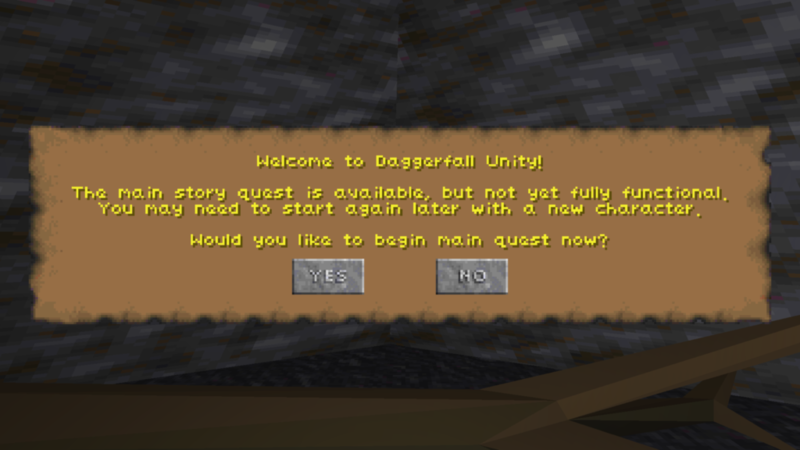 The complete main story quest is now offered when starting a new level 1 character. Please keep in mind this is still under construction, so you are likely to reach a point where you cannot continue and may need to start fresh later (or use a console cheat). It could be another few months before all main quests are in a passing state, but I felt it was important to start offering to new players.